Step 1 Cook the pasta in boiling water according to the package instructions. Drain and set aside. Step 2 Meanwhile, in a large sauté pan heated over high heat, sauté the mushrooms in butter with the shallots, parsley and sage until the mushrooms are slightly softened, 3 to 4 minutes. Add the wine and stir until most of the liquid is evaporated, then add the broth and cook until the broth is reduced by half. Stir in the cream and tomato sauce, and bring to a boil, stirring. Cook for 1 to 2 minutes to marry the flavors. Season with salt and pepper to taste. In Recipes-list.com we have selected the most viewed recipes from category - Main courses . Enjoy the best recipes specially selected for you! 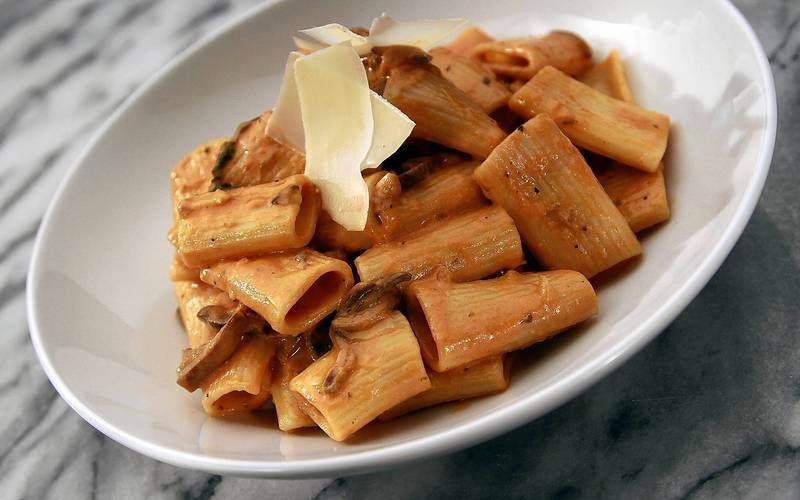 Trattoria Farfalla's rigatoni al tre funghi is the right choice that will satisfy all your claims.